During a recent renovation at our Hong Kong office, our IT team was looking to dispose of some old computers and mobile phones, and it joined with our HR team to organize a staff sale where the proceeds would be donated to charity. The recent sale raised HK$21,550 (approximately US$2,780) thanks to our employees’ purchases of more than 90 items! 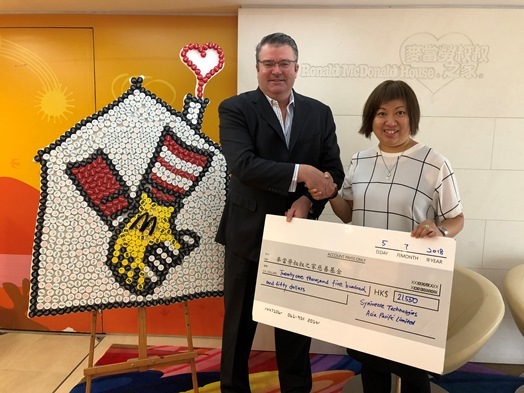 Our Hong Kong office Employee Association, after looking at a number of charitable organizations, decided on Ronald McDonald House Charities of Hong Kong. Ronald McDonald House Charities is a global nonprofit with locations in more than 64 countries that has the McDonald’s restaurant chain as its largest corporate sponsor. This organization provides a home away from home for families whose children are hospitalized so families can more easily stay close to their loved ones during this critical time. The Ronald McDonald House in Hong Kong offers 23 family units, a common kitchen, library, study room, play area, dining area, and garden, as well as an isolation suite specially designed for families and post-bone-marrow transplant child patients. Presenting our donation to Ronald McDonald House Charities of Hong Kong. Over 40 employees purchased at least one piece of equipment. The event was organized by our office’s Employee Association. This is Syniverse’s global organization whose chapters are responsible for leading charitable and extracurricular activities in communities where Syniverse offices are located. Each year, Syniverse Employee Association chapters around the world identify charitable organizations in their local areas, and then get the input of the office’s employees to select the charities that the office would like to support. Our IT team identified all laptops, mobile devices and monitors that previously had been marked for disposal. These were pieces that had accumulated over the last few years and included equipment that had become obsolete and in some cases damaged. Our IT, HR and legal teams then arranged and promoted the sale of these items to the office We ended up selling 91 items and raising HK$21,550 for charity. The most rewarding part is knowing how this money will be used to help so many families with terminally and chronically ill children in times of great need. At the same time, it was rewarding to find a way to take equipment that was obsolete and use it to raise money for such a worthy cause. We look forward to uncovering similar opportunities in the future for the benefit of our community! Paul Hodges is Senior Vice President, Sales, at Syniverse's Hong Kong office.